Happy 2012 everyone! I hope everyone had a happy and healthy holiday, and haven’t spiraled into a massive depression upon returning to our normal lives (ed note: I need to take my own advice)! I know the holidays seem like they should be over, but really, ladies, Valentine’s Day (aka Day To Get A Present For No Reason, OR Day A Guy Should Get You One To Stay In Your Good Graces) is coming up quick. 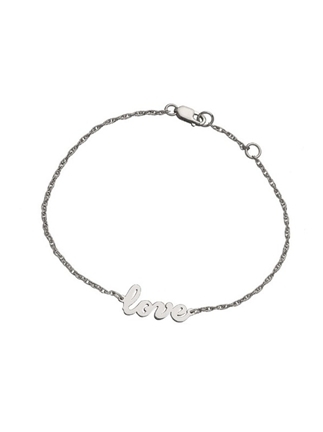 This “love” bracelet from Charlotte’s is an excellent suggestion for anyone in the market! It’s actually something I myself picked up for Christmas, and is one of my most favorite things. I love it so much (I know). It’s a really sweet and meaningful sentiment, and it makes for an adorable bracelet. 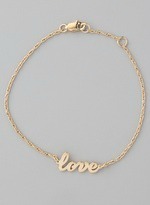 It’s not too early to start dropping hints, or to pick one up for yourself-cause if you don’t love you then who will! Comes in gold and silver-I got the gold for a little something different and have worn it every day! It always makes me smile!